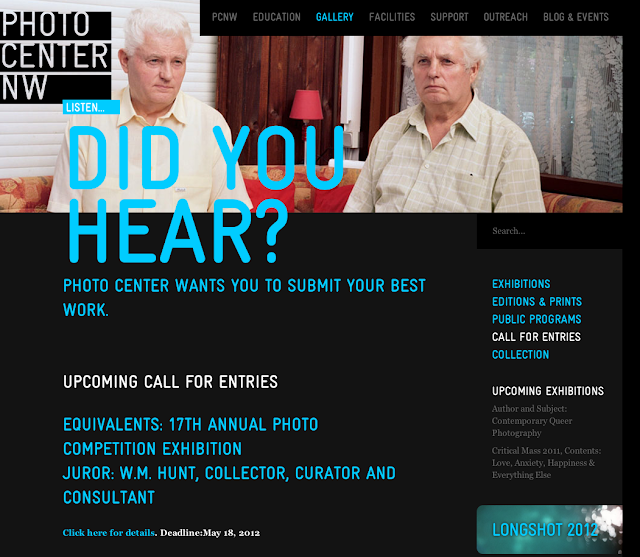 In addition to presenting fine art photography exhibits, The Perfect Exposure Gallery has a long-standing reputation for working with a distinguished group of acclaimed photojournalists to produce ongoing seminars and workshops for both adults and youths. Now, we are giving amateur and professional photographers the grand opportunity to win cash prizes and a spot in our two-month-long summer exhibit. 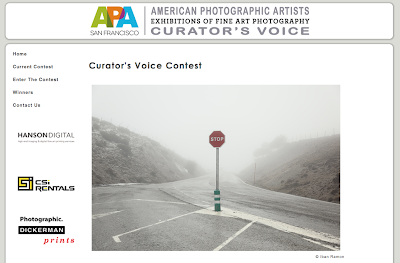 For the first APA SF Curator’s Voice Exhibition, we asked Gwen Lafage, founder of Carte Blanche Gallery in San Francisco, to select a small group of photographers to exhibit their finest images in her gallery. This competition invites photographers to submit a series of photographs interpreting the theme (Un)Familiar, along with a brief statement or project proposal supporting their entry. We are looking for a wide interpretation of the theme and therefore a wide range of imagery; your photographs can be visualizations of the Familiar, the Unfamiliar, or both. Your statement needs to quickly present your project and explain why you believe it fits with the chosen theme. Ideally, your proposal should help us understand how, or if you adapt your photographic process based on your relationship to and/or intimacy with the subject or environment being depicted. This entry was posted in Contemporary Photography, L E N S C R A T C H, Uncategorized and tagged Andrew Smith, Callanan, Cash Prizes, Contemporary Photography, Contest Deadline, Contest Theme, Distinguished Group, Fine Art Photography, Founder Editor, Grand Opportunity, International Juried Competition, Juror, Lafage, Merriment, Noon Pdt, Panel Of Judges, Perfect Exposure, Photo District News, Photo Editors, Photographer, Photographers, Photographic Artists, Photographic Workshops, Photographs, Photography Contest, Photography., Photojournalists, Portrait Photography, Professional Photographers, Santa Fe Workshops, Smithson, Summer Exhibit, Theatrical Performance, W M Hunt on May 6, 2012 by Aline - lenscratch.blogspot.com/. In case today allows for some time to submit to things, I wanted to share two calls for entry that I have the pleasure of juroring, and several other submission opportunities….. The A Smith Gallery in Johnson City, Texas is offering an photography competition on Imagination and I am the juror! i-mag-i-na-tion: fabrication, fantasy, illusion, imagery, insight, inspiration, originality, thought, vision, creation, creativity, inventiveness realization. Imagination feeds the need to photograph. Since I can remember, I have loved to create with my mind and my hands. This desire was instilled by a mother and grandmother who shared the same compulsion. These imaginative women taught me to dream and experiment. “I-mag-i-na-tion” is your opportunity to imagine and create. Get outside the conventional with this one. Don’t just photograph the pear; hide it underneath a cloth napkin and see what happens. Forty-five images will be selected for exhibition and a Blurb full color catalog of the exhibit will be available for purchase. Cash prizes of $250 each will be awarded for The Juror’s Award and The Director’s Award, along with a $100 prize for the Visitors’ Choice Award. There will also be five Honorable Mentions. 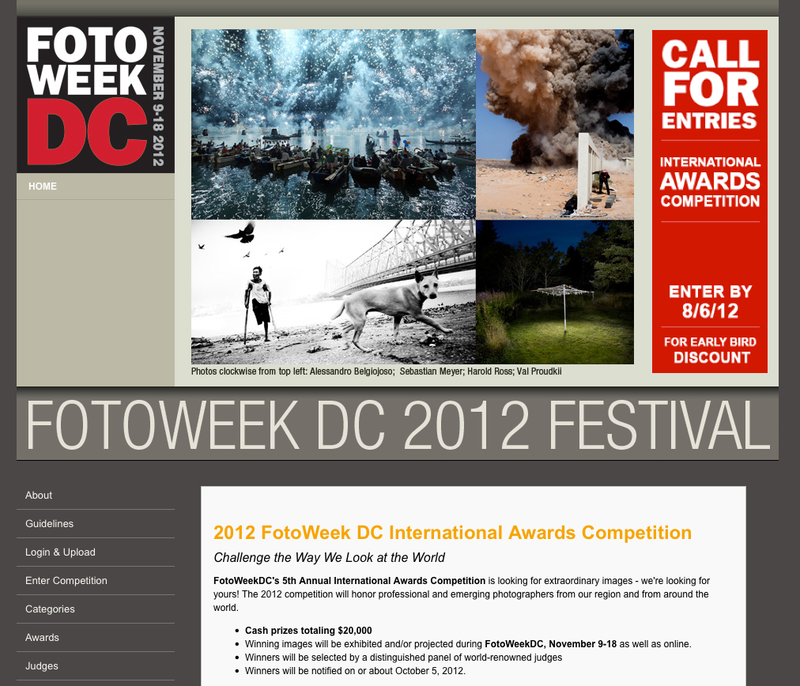 Cell Phone Photographers submit to the iSpy: Camera Phone Photography Exhibition! 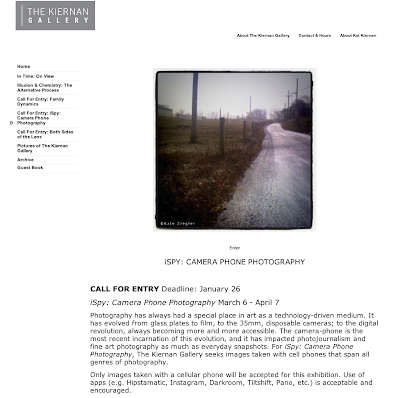 I am happy to be the juror for the upcoming iSpy: Camera Phone Photography at The Kiernan Gallery in Lexington, VA. Photography has always had a special place in art as a technology-driven medium. It has evolved from glass plates to film, to the 35mm, disposable cameras; to the digital revolution, always becoming more and more accessible. The camera-phone is the most recent incarnation of this evolution, and it has impacted photojournalism and fine art photography as much as everyday snapshots. For iSpy: Camera Phone Photography, The Kiernan Gallery seeks images taken with cell phones that span all genres of photography. 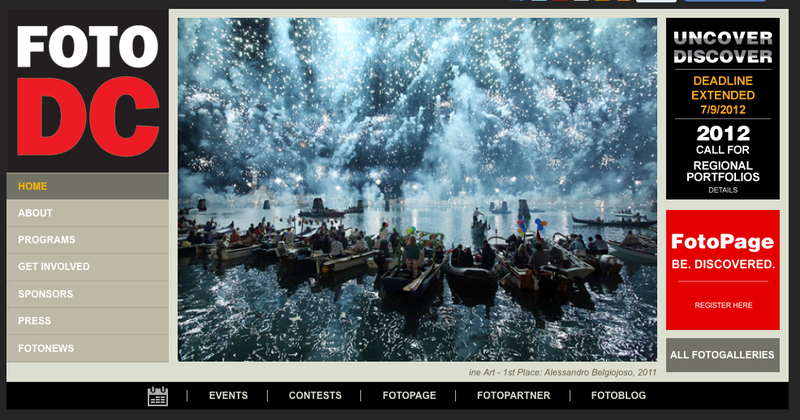 Only images taken with a cellular phone will be accepted for this exhibition. Use of apps (e.g. 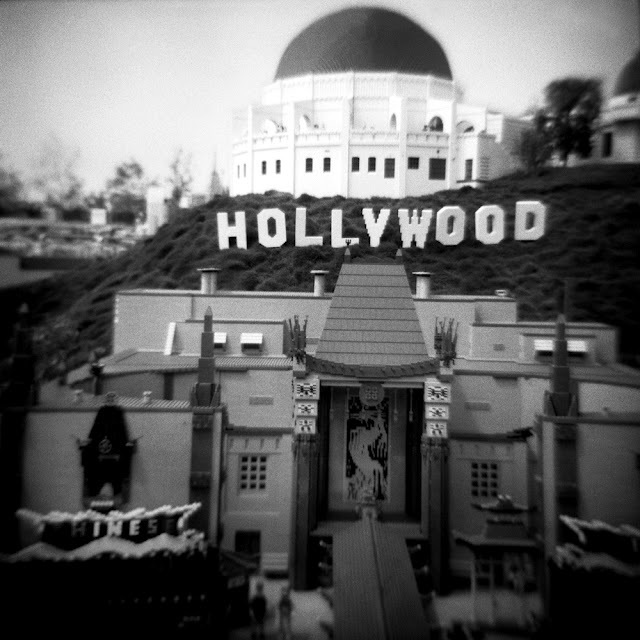 Hipstamatic, Instagram, Darkroom, Tiltshift, Pano, etc.) is acceptable and encouraged. For this exhibition, juror Aline Smithson will select up to 40 images for display in the main gallery, and up to an additional 30 to be included in the online gallery. All images will be reproduced in an exhibition catalogue available for purchase. A Juror’s Choice and Director’s Choice will also be announced. Educators that are members of the Society of Photographic Educators, Submit! 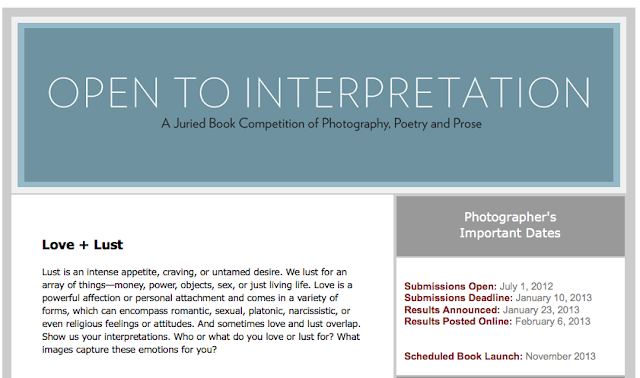 This is a very cool Juried competition that results in a book of Photography, Poetry and Prose…. George Slade has provided fine photographic artists and their audiences with insightful interpretation and curatorial expertise in exhibitions, classes, writings, lectures, and face-to-face exchanges for over 25 years. Formerly the artistic director of Minnesota Center for Photography, the director of the McKnight Artist Fellowships for Photographers Program, and recently the curator at the Photographic Resource Center in Boston, George is a veteran presence at portfolio review events like Fotofest, Photolucida, Critical Mass, PhotoNOLA, and the Society for Photographic Education’s regional and national conferences. In the last three years he juried regional and national exhibitions for the Coalition of Photographic Arts (Milwaukee), New Directions 2009 at the Wallspace Gallery (Seattle), the 2011 Clarence John Laughlin Award at the New Orleans Photographic Alliance, the New England Photography Biennial at the Danforth Museum of Art (Framingham, MA), and IRevelar at the Naomi Silva Gallery in Atlanta. George received a 2007 award from the Creative Capital/Andy Warhol Foundation Arts Writers Grant Program; his writings and reviews appear extensively in print and online; some may be found at his web site, re:photographica. He lives in Minneapolis with his partner Stephanie and their children. What makes a portrait a portrait? How is it different from a snapshot, still life or a landscape? Do we learn who a person is from a portrait or do we learn more about the photographer? The portrait is the subject of issue #51. Issue #51 will have an expected publication date of February 1, 2012. Only one submission per person for an issue. Issue #52 will have an open theme. Submit up to 12 images following the guidelines below. Images must be received by March 15. Issue #52 will have an expected publication date of April 1, 2012. Only one submission per person for an issue. This entry was posted in Contemporary Photography, L E N S C R A T C H, Uncategorized and tagged Antoine De Saint, Antoine De Saint Exupery, Cash Prizes, Choice Award, Color Catalog, Compulsion, Contemporary Photography, Exhibition Dates, Honorable Mentions, Ispy, Juror, Kiernan Gallery, Mother And Grandmother, One Don, Pablo Picasso, Photogr, Photographer, Photographers, Photographs, Photography Competition, Photography Exhibition, Photography., Rock Pile, Single Man, Vision Creation on January 2, 2012 by Aline - lenscratch.blogspot.com/. Use your imagination and submit! I-mag-i-na-tion is your opportunity to imagine and create. Get outside the conventional with this one. Chiropractor Sherman Oaks . Dont just photograph the pear; hide it underneath a cloth napkin and see what happens. Forty-five images will be selected for exhibition and a Blurb full color catalog of the exhibit will be available for purchase. Cash prizes of $250 each will be awarded for The Jurors Award and The Directors Award, along with a $100 prize for the Visitors Choice Award. There will also be five Honorable Mentions. online radio luisteren . This entry was posted in Contemporary Photography, L E N S C R A T C H and tagged Antoine De Saint, Antoine De Saint Exupery, Cash Prizes, Choice Award, Color Catalog, Compulsion, Contemporary Photography, Exhibition Dates, February 17, Honorable Mentions, Juror, Jurors, Mother And Grandmother, One Don, Originality, Pablo Picasso, Pear, Photographer, Photographers, Photographs, Photography Competition, Photography., Realization, Rock Pile, Single Man, Vision Creation on December 4, 2011 by Aline - lenscratch.blogspot.com/. This entry was posted in Contemporary Photography and tagged Call International, Cash Prizes, Category Multimedia, Contemporary Photography, Culture, Global Exposure, International Exposure, International Jury, New Category, Photographer, Photographers, Photographs, Photography Experts, Photography., Submission, Submissions on July 1, 2011 by Jim.